Greenlam Sturdo locker systems opens up a new generation of locker systems - a world of ultra-modern and exceptionally smart storage solutions made using Greenlam Compact laminates. Brilliantly designed and exceptionally durable, our restroom lockers and partitions are ideal for high humidity areas such as fitness clubs, sauna rooms, swimming pools, retail environments and sports centers. 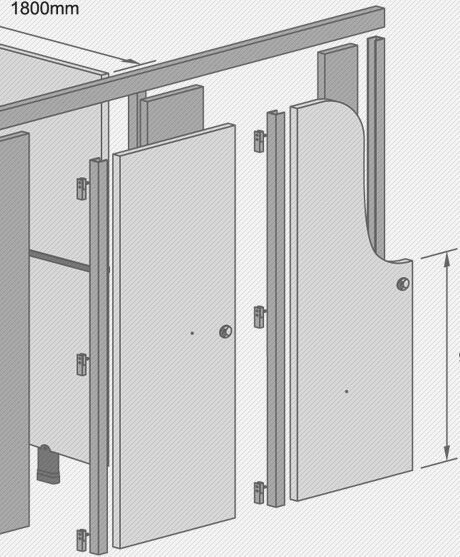 Available in a wide range of styles, sizes, configurations and colors to achieve a perfect match with your services and interior designs, our restroom locker systems are extra-tough, environment-friendly, easy-to-install and even easier to use. What's more, locker partitions come with unique Anti-bacterial property that makes them a superb choice for hygiene concern areas. Greenlam Sturdo locker systems offer excellent hygiene properties as these are made using path-breaking Antibacterial Compact Laminates. We are a leading changing room locker manufacturer in India, and give you access to a wide range of high quality locker systems designs including sports storage lockers.